ATHENS, Ga.— According to the Atlanta Journal-Constitution, the Georgia Bulldogs have found their new head coach in Alabama defensive coordinator Kirby Smart. The news came down about 36 hours after they held a joint press conference with exiting head coach Mark Richt and J. Reid Parker Director of Athletics Greg McGarity. An announcement isn’t expected to be made until after the Crimson Tide play against the Florida Gators this Saturday in the SEC Championship. Smart returns to a university that he is very familiar with in Athens. He was a defensive back from 1995-98 and then stayed on to be an administrative assistant for the program in 1999. Earlier this week when the rumors were floating around that Smart could be next in line to take over the Georgia program, Alabama head coach Nick Saban was asked about his abilities to take over as a head coach. 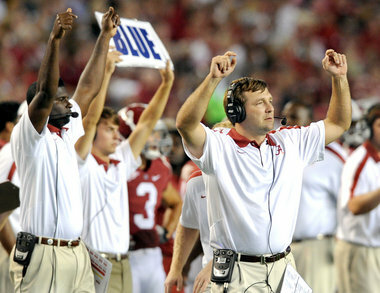 Saban has no reservations about his defensive coordinator’s coaching acumen. “I’ve said many times before in years past that Kirby has done a fantastic job for us, and I think he’ll be an outstanding head coach,” Saban said. Smart has also been recognized for this accomplishments at Alabama with the 2009 Broyles Award (given to college football’s top assistant coach) and 2012 AFCA Assistant Coach of the year. He has been the defensive coordinator at Alabama since 2008 and his groups have never finished worst than 12th in total defense. According to Jake Rowe of dawgs247.com, Smart is expected to retain four key Bulldogs assistant coaches. They are recruiting coordinator/wide receivers coach Bryan McClendon, running backs coach Thomas Brown, outside linebacker coach Kevin Sherrer and defensive line coach Tracy Rocker. There is also a report by FootballScoop.com that Smart could try to bring in good friend/former Goergia teammate Will Muschamp back to Athens to be his defensive coordinator. Muschamp is said to be a target of South Carolina to replace Steve Spurrier as their head coach. FootballScoop also reports that current Alabama strength coach Scott Cochran is also expected to come from Tuscaloosa to Athens. He was featured on ’60 Minutes’ in 2013, (which can be watched here). At about lunchtime on Sunday, we all received the news that 15 year head coach Mark Richt would be coaching his final game for the Georgia Bulldogs in their upcoming bowl game. The school released that Richt and athletic director Greg McGarity mutually decided for him to step down at the end of the season. Richt leaves Georgia with a record of 145-51. He won the SEC Eastern Division six times and was conference champion twice (2002 & 2005). The soon to be former Bulldogs head coach has an opportunity to stay with the athletic department if he wishes to do so. However, Richt is already said to be receiving interest from numerous schools with head coaching vacancies. According to reports Missouri, Maryland and his alma mater Miami (Fla.) have already interviewed him for their openings. The Terrapins might be off the table, as reports have surfaced that they are going to hire Michigan defensive coordinator DJ Durkin to lead their program. Richt did say on his weekly radio show that five schools had already contacted him and that he would weigh his options before deciding if he would jump immediately back into coaching. We can expect him to coach a little differently than he did in the later years at Georgia, if indeed he decides to get in. He at least said as much on Monday. Wherever Richt ends up as the head coach, we can probably expect to see him do the same things he did at Georgia. That is win, coach with class and make the program better off when he leaves than when he took over. In a whirlwind week surrounding the Georgia program, senior offensive tackle John Theus found out that he would be joining wide receiver Malcolm Mitchell and outside linebacker Jordan Jenkins at the Reese’s Senior Bowl in Mobile, Ala. On Sunday, when the Bulldogs players found out that Mark Richt would no longer be their head coach, junior outside linebacker Leonard Floyd announced he would forgo his senior season to enter the NFL Draft. Floyd first shared his news with the assembled media on Sunday by yelling “I’m gone too, by the way” at the assembled media outside the Butts-Mehre Building. He also went public with the news on his Twitter account. Theus has started in 47 out of his 52 games played during a four year career on the Georgia offensive line. He has played both the right and left tackle positions for the Bulldogs. Floyd is currently the second leading tackler for the Bulldogs defense in 2015. He is tied with Jenkins in tackles for a loss with 10.5. He leads the team in sacks with four and a half. The outside linebacker showed off his versatility this season by playing an inside linebacker position. He also showed coverage versatility at the “Star” position. WalterFootball.com’s early mock draft has Floyd going 15th overall to the Oakland Raiders.